As I glanced over at the calender on my desk yesterday, it dawned on me that October is over. It's O-V-E-R.
My next realization: It's time to wrap up 2009 and put it away in the archives. Which means that dreaded December 31 is almost upon us. I found myself in a semi-panic state. Where will I be on December 31 2009? The holiday season in Korea is nearly as bad (if not worse) than Valentines Day and is definitely not a good time of the year for singletons like myself to be alone. At least on Valentines Day, it's just one day, but the festive season in Korea starts from Christmas to New Year to Korean New Year in February! Families who live in different cities and provinces reunite and many travel to the countryside to visit grandparents. Those that remain in the city either hang out with their other half or just stay home and don't want to be out, because it's too cold (midst of winter). Personally speaking, if I wanted to go out, I don't really care about the weather condition. As long as I can get to my destination safely and be with the people I want to spend time with. I remember my first holiday season in Korea. I was only here for about 4 months and my first foreign friend and lifeline at the time, Dimitri said we'd spend New Years Eve together. We weren't in the mood for 'house parties' or ushering in 2008 in a stuffy, sweaty, smoky club. I agreed. And was also relieved that I wouldn't be in my apartment - watching TV, on the internet or God forbid, sleeping while the rest of the people in my timezone welcomed in the new year. 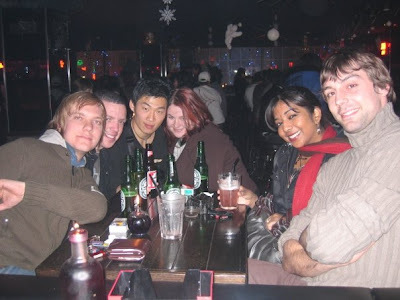 We met in Hongdae - an area in Seoul populated by university students and bars, pubs and clubs. Dimitri arrived there first. It took me nearly two hours to get to him because of the heavy traffic. I nearly contemplated turning back and just going home. Was it really worth the effort? But Dimitri was there already and I couldn't stand him up. We went to Burger King for a while and then met up with a couple of his friends and went to Ho Bar. We were lucky to get a table right next to the bar. Midnight seemed to be taking forever to come 'round. When the clock eventually struck 12, we all wished each other and hurried out to catch the subway home. Unfortunately, my subway line was closed and I had to take a cab home. Last year this time, I made a few new friends - a teacher at my school and some of his friends he'd introduced me to. No one had plans for New Years Eve so we agreed to spend the evening together. I flew to Singapore on Christmas Eve (alone) and from there I went to Malaysia.. back to Singapore and then to Korea just in time for New Years Eve. Spending Christmas alone wasn't as bad as I anticipated. There were families and couples everywhere and the Christmas vibe was infectious. But I didn't feel lonely at all. Of course, I'd met people during my journey and my iPod Touch kept me company. Back in Korea on New Years Eve, I heard that some of the guys I was going to spend the evening with had plans that had come up with their family. I thought I should have extended my holiday in Singapore and spent New Years there. But my friend, Yong-un called and suggested we go over to his friends place for the evening. His friend, Hong-il and his wife, Hye-jin were expecting a baby so they were going to be at home and invited us over. It was a nice evening...chilled and relaxed. 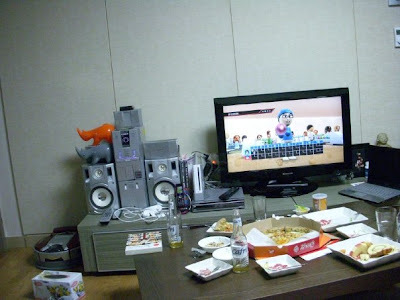 We ate, talked and played a bit of Wii. It was definitely more intimate than my New Years Eve the previous year. As I write this post - October 31 2009, there are exactly two months left till New Years Eve. Am I silly to be fretting over where I'll be? I've already thought of being somewhere else - out of the country - probably alone, but it'll be better than being here - alone. I know it sounds a bit strange, but for me it's better to be somewhere else alone, than at home...alone. The same goes with the recent Korean Thanksgiving holiday (Chuseok) which was a month ago. Everyone I knew was going to spend it with their family. (I was actually invited to spend the week-end with my friend Hye-jin's family) I had no concrete plans and was probably going to be at home - alone. But at the last minute, I decided to go to Jeju Island and I had a fantastic time exploring, sight-seeing and taking photos. Some of the best holidays I've had have been the ones I've taken alone. Well, I guess I'll just have to wait a few more weeks to see what will crop up! Do you have plans for New Years yet?